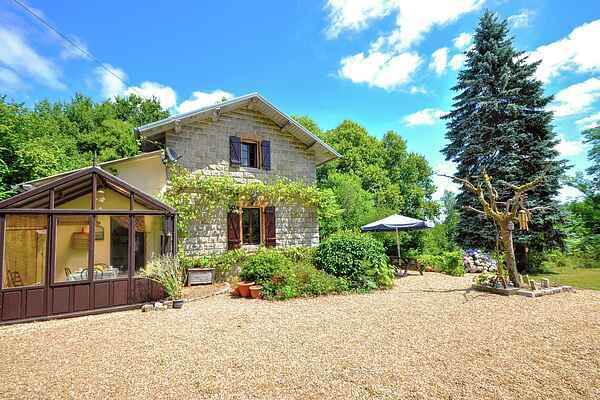 This charming cottage has the advantage of its location, tranquility and contact with nature. It's a romantic restored railway house and it offers all the comforts needed to spend a nice holiday. The garden of about 2000 m2 is very quiet and surrounded by a forest; you can relax on the terrace overlooking the beautiful garden, or have your breakfast on the veranda during chilly mornings. The unique location in the heart of the \"Parc Naturel Régional Périgord Limousin\" makes this holiday home an ideal spot to relax, but you can also enjoy all kinds of sights in the area. Large recreational area with Lake and beach, www.espace-hermeline.com, a 5-minute walk away. (Parking-tennis-mini golf-velo rail-kiosk etc.) Route Richard the Lionheart (Richard Coeur de Lion). Limoges; enamel and porcelain city, shopping, squares with terraces and places of interest. Perigueux; cosy city center and various places of interest. Knight plays in different locations, markets and brocante, marché des producteurs. Open air international music festival in Confolens (3rd week August on Fri-Sat-Sun) Delicious natural products such as cherries, strawberries, walnuts, chestnuts, mushrooms, quality meat and fish.